Hi there stamping friends! This is an exciting week with the Stamping 411 Operators Crew - we have Thanksgiving weekend Blog Candy for you over at the Stamping 411 Blog. All you have to do to enter the drawing for one of SEVEN different prizes is leave a comment for us on THIS post, answering the questions posed in the post. We at Stamping 411 are so thankful for you, our loyal readers and players that we decided to do something special just to show our appreciation. We wouldn't be who we are without wonderful stampers like you! For my card with today's sketch, I decided to show you a completely different look. 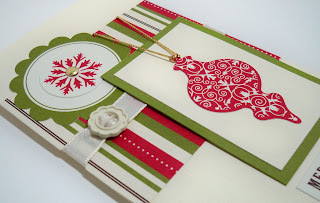 I took some leftover pieces of the Christmas Jingle Simply Scrappin Kit and used them to create my card. I love the Simply Scrappin' Kits because they have so many different pieces to work with that even after you complete a major project with one, you still have sooooo much left over to play around with to create more! Believe it or not, there is NO stamping on this card at all! I've begun using up the other cardstock, designer paper and sticky die-cuts by making cards and a card box. So far I have 7 cards and a box cut with the Fancy Favor Die on the Big Shot. I'll be posting them later this week as well. Today's Stamping 411 card starts with a piece of 6" x 6" Textured Very Vanilla cardstock, folded to make a 3" x 6" card. The striped designer paper layer is 2 3/4" x 3". After adhering it to the card front, I nipped a small slit in the fold of the card with my Horizontal Slot Punch to create a hole for my Very Vanilla Taffeta ribbon to slide through. I added the Styled Vanilla Ribbon Slide to it before adhering it to the card front. The Scalloped Circle layer is a sticky die cut, layered with the snowflake sticky die cut. I used my Paper Piercer to add a Gold Brad to the center before sticking this embellishment to the card front. The next two layers are Textured cardstock pieces from the kit, the old Olive layer is trimmed at 1 3/4" x 2 3/4" and the Very Vanilla layer is 1 1/2" x 2 1/2". 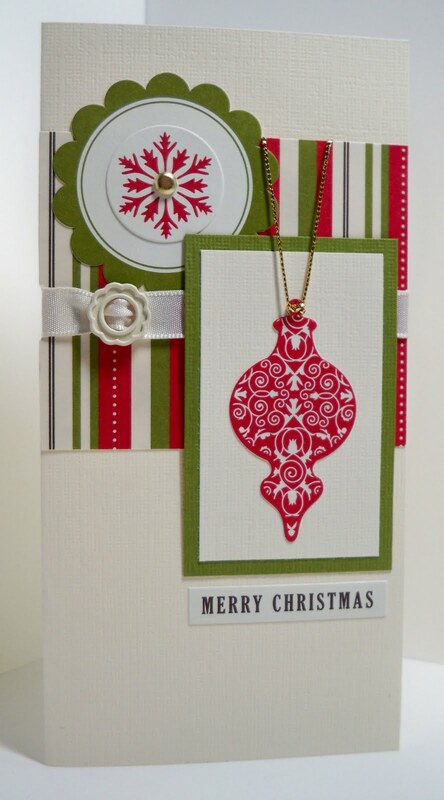 I've used one of the red ornament sticky die cuts for the focal point here. The Gold Cord is actually knotted around the top of the die cut like a hanging ornament and I've adhered the ends behind the striped designer paper. Lastly, I've added my sentiment with yet another sticky die cut for a simple Merry Christmas. I will tell you that I thought briefly about stamping with the Tree Trimmings stamp set on the background of this one, but decided to keep the look clean and simple. I like just the texture of the cardstock on this one. It keeps it very crisp looking. For the other cards I created in my set of 6, I did stamp on the background. When you see them later this week, you be the judge of whether or not it works! I look forward to hearing your thoughts! So, now it's YOUR turn! 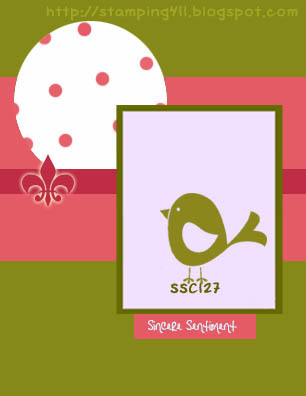 Use the Stamping 411 sketch and create something fun! We love to see your artwork and are excited each week to see what you've come up with based on Selene's fabulous sketches! Be sure to leave your comment on the Thursday post and enter to win the Blog Candy! And thanks so much for being the fabulous readers and stampers you are! You make our days special! This is so pretty Robin! I really need to use the kits more!!!! The results are stunning!! You hit this one out of the park, and down the street! This is clean, simple and stunning. Wowzah! Fabulous clean and simple card. Gotta love the Christmas Jingle SSK! I love that you added fun textures, especially the ribbon slide. I need to use mine! Great job with the sketch. This is my favorite card this week! When I first looked at it I thought WOW that looks hard and then when I enlarged the picture I realized there wasn't even any stamping!!! It's really beautiful, I love the CAS lines of the card, I think your decision to leave it like that was a good one! OMG!!! You know I love this. I'm all about Clean and Crisp!!! This is knock your socks foo GORGEOUS!!!!! Love it!!! This card is beautiful. Wonderful creation from the layout. This is so clean, simple and elegant all wrapped up in one!!! You totally ROCKED this sketch Robin!! Luv it!! Wow, wow and more wow! You sure did create an amazing card. Love the clean look. And the way you've hung the ornament. total perfection. I also love the ribbon slide. It's a perfect . Nice and crisp!!! Love it!! !